Adopted a healthy vending machine policy that promotes healthier snack and beverage options and purchasing ease for visitors and employees and energy savings in City buildings. Budgeted and hired a wellness coordinator who develops programs and services that enhance health and wellness for nearly 900 employees of the City of Lakewood. Budgeted additional funds consistently for the last 10 years to build sidewalks. Improved sidewalks help create safer and more walkable pedestrian-friendly environments. 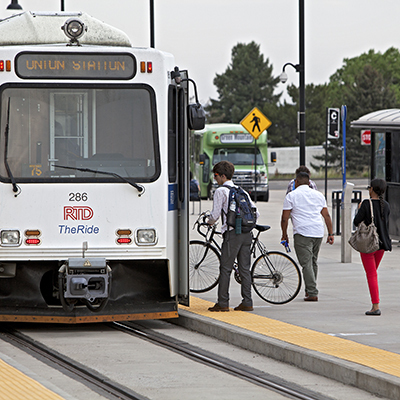 Created the Sheridan Station 20-Minute Neighborhood Implementation Strategy, which focuses on providing residents safe and convenient access by walking, bicycling or transit to many of the places and services they use daily, using the Sheridan light rail station as a transit hub. Funded a high-intensity activated crosswalk, known as HAWK, signal on Union Boulevard. This traffic signal makes it easier for pedestrians to cross Union to access both businesses and the Federal Center light rail station. Forty-six cities are a part of the LiveWell Colorado HEAL Cities & Towns Campaign, which began in 2013. “We partner with LiveWell Colorado on the HEAL Cities & Towns Campaign because we believe a healthy community is a viable, sustainable community for future generations,” said Sam Mamet, executive director, Colorado Municipal League. Since the campaign began, municipalities in Colorado have adopted more than 70 policies tied to healthy eating and active living across the state. To learn more about Lakewood and its healthy living initiatives, please visit www.lakewood.org. LiveWell Colorado is a statewide nonprofit organization committed to preventing and reducing obesity in Colorado by promoting healthy eating and active living. With the goal of eliminating health disparities and advancing health equity, LiveWell Colorado focuses its efforts on policy, environmental and lifestyle changes that remove barriers and increase access to healthy behaviors. Working in partnership with obesity prevention initiatives across the state, LiveWell Colorado aims to provide every Coloradan with access to healthy foods and opportunities for physical activity to make Colorado the healthiest state in the nation. For more information, please visit: LiveWellColorado.org. The HEAL Cities & Towns Campaign is supported by a grant from the Kaiser Permanente Community Health Fund, a donor-advised fund of the Denver Foundation.